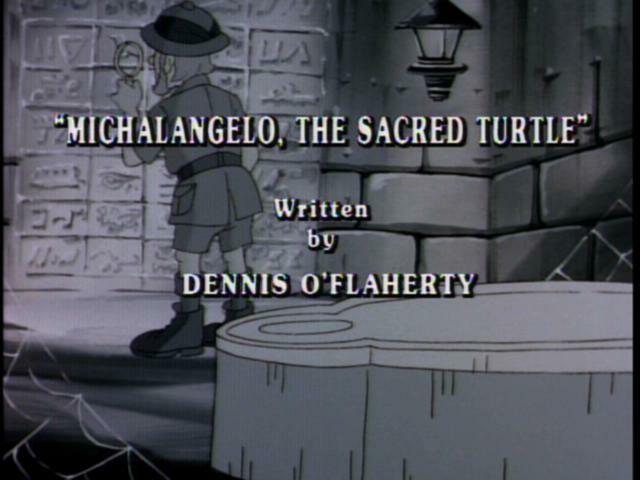 While the other Turtles go off to the local Planetarium to see O’Malley’s comet, Michaelangelo goes off to the Natural History Museum with April O’Neil for the unveiling of the mummy of Ahmed Turt-el. At the front door, April and Michaelangelo are warned of the ancient curse by an Egyptologist, Sir Percival and his man servant Casbah. April and Michaelangelo pay them no mind and enter the Museum. No sooner is the sarcophogus opened, when the lights go out. The ghost of Osiris is revealed and a precious ruby, the Turtle’s Eye, is stolen from the tomb — along with April. 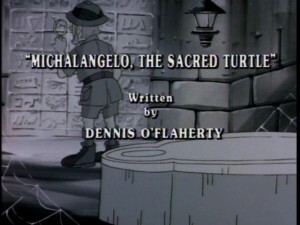 While Michaelangelo unsuccessfully tries to contact the other Turtles, April is delivered to Sir Percival’s home, which is a replica of the Sphinx on the site of the old World’s Fair. Here Percival details his plan to harness the power of O’Malley’s Coment with the Turtle’s Eye Ruby. He plans to use the gem as a ray magnifier, which he will use to “rule the world” and make April his queen. Back at the Museum, Michaelangelo is accused of being the thief until his true Turtle identity is revealed. The people think that Mikey is the spirit of Ahmed Turt-el, the sacred Turtle. All bow before him. Meanwhile, the other Turtles get wind of the theft, the disappearance of April and the curse of Ahmed Turt-el. They rush over to the Museum only to learn, thanks to Donatello’s ability to read hieroglyphics, that there is no “curse of Ahmed Turtle — only the “purse of Ahmed Turt-el. The TMNT decide to track down this so-called Egyptologist. Back at the Museum, Michaelangelo dons the clothes of Ahmed Turt-el and leads his followers to Sir Percival’s Sphinx only to find themselves trapped in a chamber with closing walls. They escape with only moments to spare and team up with the other Turtles who have come to April’s rescue. Meanwhile, inside the Sphinx, Sir Percival has locked his ray onto O’Malley’s comet. What Sir Percival does not know is that the Turtle’s Eye will not give him incredible power but will only cause the comet to crash to Earth. While Raphael, Michaelangelo and his followers do battle with Casbah and other followers of Sir Percival, Donatello and Leonardo escape and rush to the Planetarium via the Turtle Blimp. At the Planetarium, Donatello and Leonardo divert the path of the Comet, thereby saving the world from certain destruction.